US immigration at Dublin and Shannon operating Trump’s ban on people from 7 Muslim countries. There are already many people stuck at various airports accross the world. People arriving to US airports are detained by the immigration departments. THE US EMBASSY in Dublin has confirmed that Donald Trump’s executive order of a 90-day ban on people from seven Muslim countries entering the US is in operation at Dublin and Shannon Airport. Today (28/01) as we are calling this rally in Dublin, there were emergency protests US airports in support of the detained migrants. JFK Airport protests has hundreds attending. Residents in US cannot return home. Iran’s Asghar Farhadi won’t be let into the US to attend Oscar’s. He’s nominated for best foreign language film. 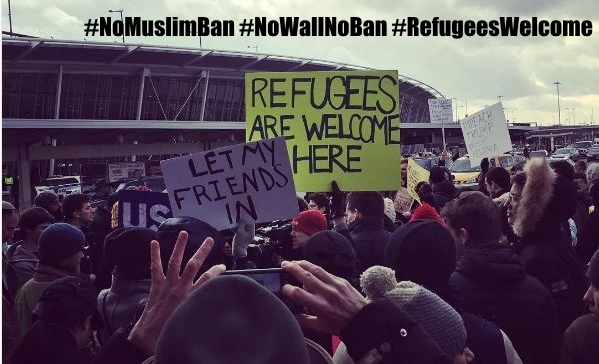 UN refugees are not allowed to enter US. This has nothing to do with protecting US citizens against terror. This travel ban is yet another racist Trump policy in action. This is an attack on freddom of travel. Today it is the Muslims in 7 countries, tomorrow the Mexican immigrants, next the undocumented migrant workers in the US.